Hi, my name is Penny Bark-Bark, well really it is just Penny, but mom calls me Penny Bark-Bark because I loooove to talk!Being such an active and chatty girl I thought why not just bark at the world. My has me spoiled beyond belief, always getting me toys to taking me out on adventures so I thought it would be a great idea to share my barks with the world. Since keyboards aren’t exactly made for paws and bark-to-text translators just don’t get it right, my mom agreed to take on the job of my personal assistant and work the PC for me. 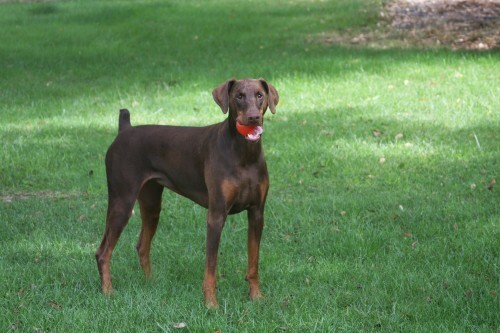 Just a short intro to my life, I am a 3 year old Doberman Pincher and I LOVE to go on hikes; wind, rain or snow if it is safe to drive to the trails mom and I are going! I live with my big brother Trey who is also a Dobe, two small siblings mom calls cats and 2 VERY BIG dogs mom calls horses. Of course I also have my mom and dad or as I call them, wallet and chauffeur (just kidding mom and dad). So, I thought I would come on here and bark about my adventures and my about my doggie spoils. Hopefully my barking can help others choose toys and accessories that work for them and maybe help encourage an active doggie life. I saw Penny Bark Bark wearing a storm trooper costume and would love to have one for my pitbull who will be 4, almost 5 months, when Halloween comes around. Can you please tell me where I can get out or if you make them? Sorry the costume was custom made by us so it can’t be purchased. Really the best option for your pup (whom is the perfect age to start learning to wear helmets!) is to build one out of craft foam. We are going to try to build another one ourselves when we get time so it is lighter and easier to wear (the original helmet is fiberglass). There are a ton of tutorials out there about working with craft foam and EVA foam to make some killer costumes. I always just add “cosplay” to any search for craft foam or EVA foam and you come up with amazing results and great videos. Although they are not typically pet related you just need a bit of imagination and you can come up with a great costume. 1. How did you paint? With sponges, brushes, air gun, … I’d like to know how did you get those smooth surfaces. Also, in the #14th square, do you remember the proportions you use in ypur PVA/Latex/Acrylic mix? 2. Did you use some kind of powder after aplying latex? I painted these with brushes, the mixture ended up pretty thick so I don’t know how it would fair in an air brush or what would happen if you thinned it out. If I look close in the right light I can see the strokes but you do have to look close. For the mix I was doing small mixes for a test so I don’t remember exactly what I did for those samples but I am pretty sure for the latex I tried to keep the proportions close to what they had on the bottle and for the PVA I added much less for those tests. It’s been a little while since I mixed up a batch but my big thing is adding enough latex for it to flex and PVA for it to want to stick. The last time I mixed up a batch for our Iron Dog costume I added my paint to a mason jar, probably did about an 1/8 of the amount of PVA, then started with about the same for latex. I then did tests on the type of foam I was using adding enough latex until I got the result I like without distorting the color. It was a bit of an art which changes depending on the type of foam. Also I didn’t use any powder. On the original costume which was made from EVA foam, there was Velcro sewed onto the body suit and glued onto the EVA foam. The newer costume which is much more flexible and durable is craft foam that was skinned with stretch PVC. For these pieces I hand stitched them onto the bodysuit for a more permanent hold (but allows us to replace pieces if needed). I just put in a few hand stitches in the corners, then put a few along the edges of the bigger pieces. Since there was stretch PVC over the craft foam it was able to keep the stitch, if it was just EVA or craft foam it would have torn through. I was also able to get the costume on and off because of this thin flexibility, if you use the EVA foam you will be better off with Velcro since it will be harder to get on as one solid piece.